To mark the 350th Anniversary of the Great Fire of London, we've collected together a few interesting facts that your history teacher might not have told you about. To mark the 350th Anniversary of the Great Fire of London, we've collected together a few fascinating facts that your history teacher might not have told you about the great fire of 1666. Samuel Pepys buried a wheel of Parmesan cheese in his garden to keep it safe from the fire. 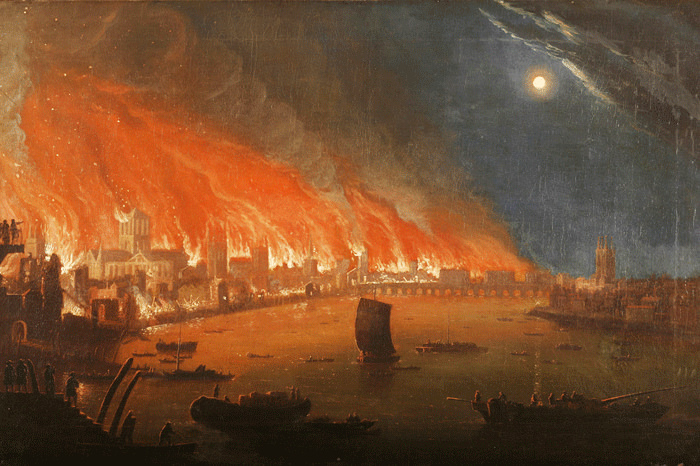 On March 16th 1667, Samuel Pepys recorded observing smoke from the Great Fire escaping the cellars of London. A whole five months after the event! Tragically, one man, a French watchmaker named Robert Hubert was wrongly executed for starting the fire. Hubert confessed to throwing a fireball through the window of Pudding Lane. Contemporaries believed him to be 'not well of mind' and afflicted by a palsy to his leg and arm. The London Gazette headline at the time gave voice to criticisms 'that if the whole industry of the inhabitants had been applied to the stopping of the fire, and not to the saving of their particular Goods, the success might have been much better'. The shortages caused by the fire were experienced first-hand by Samuel Pepys. In a humourous account written around three or four days after the fire began, he described consuming, in apparent disbelief, 'a shoulder of mutton from the cook’s, without any napkin or anything'. Within a few years, fire insurance came into being. The first 'insurance company', The Phoenix Fire Office, was established in 1680. The Monument, dedicated to the event, stands 202ft tall, corresponding exactly with the distance between it and the site of the bakery in which the fire began. Originally, the Monument contained an inscription blaming 'Popish frenzy' for the disaster. This indictment of Catholics was only erased after the Roman Catholic relief Act of 1829. Scraps of silk scorched by the fire where carried up to 30 miles from London. One such piece was found in Beaconsfield, west of London. In 1979, archaeologists found a melted piece of pottery which shows that the temperature of the fire was as high as 1700 degrees celsius. Read Peter Ackroyd's account of 1666, London's 'year of ill omen', taken from Civil War, the third volume in his History of England. Revolution, the fourth instalment in Peter Ackroyd’s History of England is out on 22nd September 2016. Love history? Sign up to our monthly history email to be the first to hear about all the latest and best historical fiction and non-fiction.